favour of the ruler and often a curiosity of calligraphers at that time. While expanding various forms and styles, skillful calligraphers continuously challenged and mastered the uncountable layers of techniques and unfolded a depth of calligraphy itself. Even if there is the same style of calligraphy, calligraphers magically unfold a different expression with Sumi ink on paper. Here are the major calligraphy styles and some examples. the GYOSHO Style. Those two are commonly practised calligraphy script. When one completes the two major styles, one can start with Sosho style. If school children in Japan have a choice of SHODO in an art class, they only practise KAISHO Style. 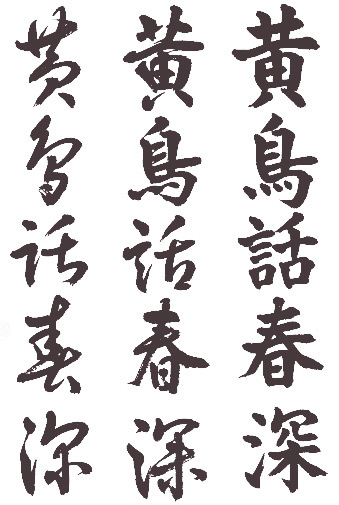 And the further calligraphy styles for Shodo practice are six types. ZEN, ZENEI,SHAKYOU are additional alternative types.